On 9 August, we celebrated our nation Singapore's 44th National Day! Yes we are a very young country, and a very small land, we are a richly multi-cultural society, a modern city, cosmopolitan if I may say, we have our share of problems and grouses, we may not seem particularly patriotic, but we are proud of our young heritage, we have our unique and Singaporean ways, food, even English (which we endearingly call ''Singlish")! And most of all, this is where we call home. 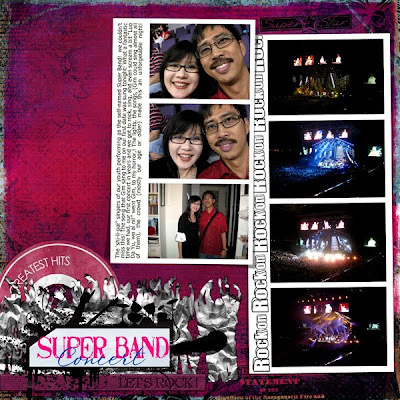 I'll like to share this song we love, written locally and sung by a Singaporean singer, Kit Chan, called, "Home". I'm sure you feel the same way about wherever in this world you call home. Enjoy! On National Day we went to the beach in Sentosa with our friends the Wong family and had a wonderful (and hot and crowded :)) time. This year, we had a thing going nationwide to have everyone say the Singapore pledge at 8:22pm, (where the parade is estimated to end) wherever we are. We were having dinner at the time, and some young people in the next table burst into it, and our boys followed suit (I am afraid we adults embarassingly can't remember all the words of the pledge). Hope I've done my little bit in introducing you to our Singapore! Credits: Background blended from papers by Vinnie Pearce and Lisa Sisneros, Greatest hits record & Super Star & RockOn stamp by Dani Mogstad, foil paper, and title stamp by Studio Mgl, Let's Rock strip by Susan Fitch. 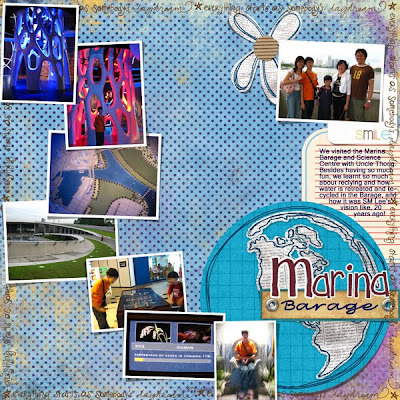 And this one is from a day visiting the science centre and Marina Barrage - which is this amazing engineering thing they did to build a dam across where the Singapore river goes into the sea, making it like a reservoir, to provide water supply, flood control and a new area for water sports! Here's the record for posterity of my (still) nearly a teen. (can you believe he is still twelve and about 5'8''?) 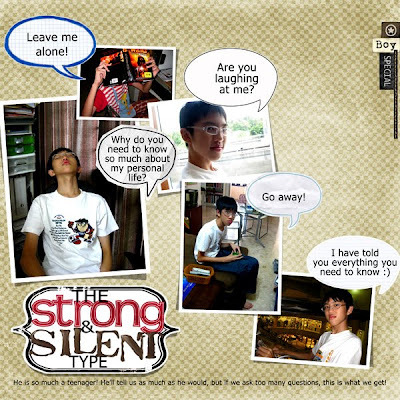 He will tell me loads but if I try to pry, then I get the strong and silent type. lol. Love the boy too! Credits: background paper by Mira designs, title mat by Lisa Marie Hankins, speech bubles by Miss mint, J Crowley, Ksharonk, Mel Wilson, Simply Scraps, word art by Chantal, 'special' by K Pertiet, red alpha by Suzy q Scraps, painted alpha by Weeds & Wildflowers. 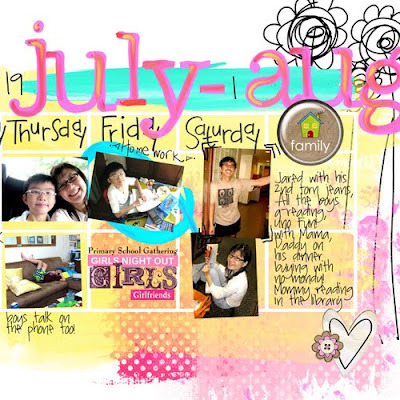 And now here's my most enjoyable 365 layout yet, I think! I got this idea off a Jounalling off the edge book, and had so much fun adding bits and pieces and paint strokes to create this. Think I'm gonna use the template more than once for sure! You can download it further down! Show me what you did with it! Credits: flower doodle by Emerritt designs, yellow paint strokes by Rachel Young, plastic paint dots by Sugar Plum Paperie, blue paint stroke by Carrie Bombria, alpha by Weeds & Wildflowers, Days words by Mel Wilson, Girls word art by Miss Mint, doodles by Scrapkitty designs, Britt designs, Megan Turnidge, Lyndsay Riches, blue circle stamp by Jackie Ecles, family element by Jay Day Studio. 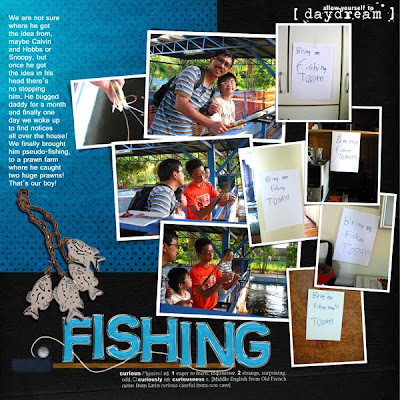 And here is another painterly layout I did of the short trip me and dh took to Bintan (it's only an hour away by ferry). 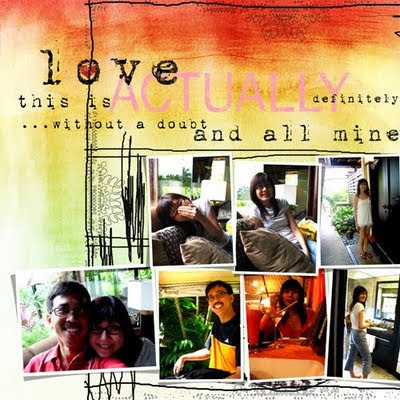 I love the graphic look I got, digging through my stuff to find these doodley pics. We had such a good time there, it's really great we still have so much fun, so much to laugh and talk about, still best friends, after 27 years of friendship and 15 years of marriage. We know we are really blessed. Your pages and photos are so amazingly creative, vibrant and colorful! Thank you for sharing! I love your pages and the templates. Thank you so much! I just discovered you today and love looking at your pages. They're incredibly inspiring! I'll definitely be taking advantage of your sale before the end of the week as I have two past vacations that I MUST get scrapped! Thank you so much for your templates! They're amazing, and so are all of your layouts! I'm very inspired!! You're very generous! Have a great week and thanks so much for the template. Thanks so much for the freebies! Ive gotten all your templates through 121 and I cant wait until I get a job again I will so be back here in a heartbeat to fill in the missing ones. You rock! Hey Yin!!! Feel free to use any of my layouts :) All I ask is that you link back to my blog:) Thanks so much and I absolutely love your templates!!!! 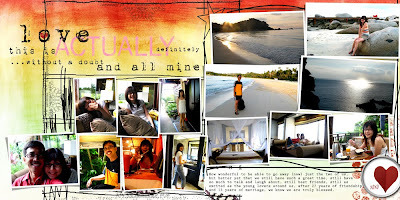 I LOOOOOVE the beach layout from your getaway together, especially the journaling. Thanks for another great freebie template! I totally understand how long it would take to do a blog entry like this. It took me 4 hours to do my Ghost Town Run entry this week. Non-bloggers have no idea how time consuming it can be!!! I always love your templates and your style. Your LOs are gorgeous. Thanks so much for the templates. Great layouts! Thank you for helping us get a lot of pictures on 2 pages and look great too! Thank you so much for this awesome sale I love using your templates they are fun, easy, perfect and pretty! Thank you so much for this Freebie. 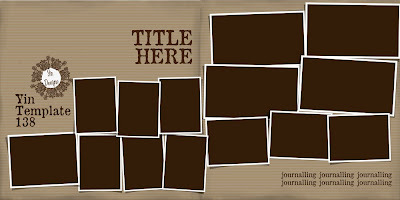 I want to let you know that I posted a link to your blog in Creative Busy Hands Scrapbook Freebies Search List, under the Template(s), Overlay(s), Photo Mask(s) post on Aug. 13, 2009. Thanks again. Thanks for two more wonderful templates. I'm always inspired by your layouts. I'm hope to take advantage of your sale to stock up on some of your templates which I've been admiring. Thanks a million for the templates. I always love seeing your layouts made with them too. I'm definitely going to try to find time to check out the store during this sale. Happy National Singapore day, I hope you and family enjoy your day off. Ours here in NZ is not until late October & is called Labour Day here. Your latest los are looking fantastic and find myself unable to keep up with your temps but that's ok as I am a very slow scrapper. Am busy scrapping my 40th getaway weekend from July and have used your 114 temp, see latest entry in my blog. Have also use double lo temp 25 which you'll find here at DST http://www.digishoptalk.com/gallery/showgallery.php?cat=500&ppuser=12391. Many thanks for your abfab temps. thank you for your templates! They are AWESOME! Thank you for sharing your templates. I love the double page format and your layouts are such an inspiration!!! I love how great your two-page layouts turn out. Very inspiring! Thanks so much for continuing to share your templates with us! another awesome template from my favorite designer! 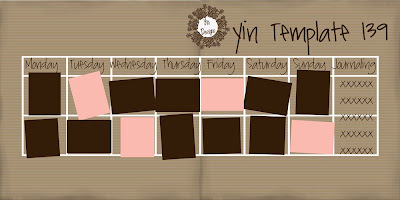 Wow thank you, Yin, you make the most awesome templates and I am so grateful! Love your templates. 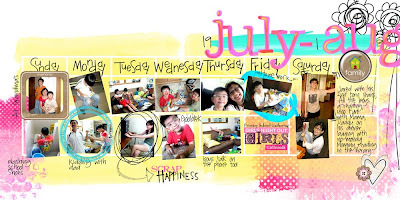 I hardly ever scrap a page with one photo - and so many templates have only one or two spaces. Thank you, thank you, thank you for another great template! They are perfect for p365 as well as all the vacation pics I took! Thanks!! Love your templates and lo's!! Awesome of you to share! You cannot imagine how delighted I am that these are still up! Thanks! I lost them all when my hard drive crashed. Thank you for another wonderful 2-page template! Thank you so much for this 2 page template. I found your blog from Cynthia at mousescrappers. Thank you for sharing your talent.